The Olympic Games are almost here, so who am I not to capitalize on this and write a quick blog post about Olympic fundraising?!?! During one of my mindless ‘surf the web because I’m too wired to go to bed’ sessions, I came across the ‘Raise Our Flag‘ campaign and found it quite interesting. The US Olympic Committee is quick to point out that our Olympians receive no government support and rely on private contributions to represent us in London this year. If you’ve ever been associated with an olympic athlete, you know just how expensive the process is. Travel, housing, etc. – it ain’t cheap! And that’s after spending a small fortune on training and equipment over the years to reach the level of athleticism necessary to make the team. Oh, and many don’t have jobs because training is a full-time endeavor. Only a few have the ability to receive superstardom levels and Wheaties boxes with big paychecks attached. The ‘Raise our Flag‘ campaign is just one way for the masses to do their part and, in their own way, participate in the 2012 games. 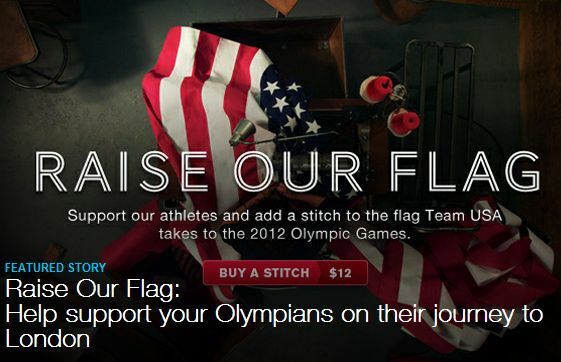 It’s a neat idea, inviting us to make a gift to buy a stitch in the US flag for $12. So far, according to the website, 29,257 stitches have been sold – that’s a little over $350,000 if you’re doing the math. Undoubtedly, that’s just a drop in the bucket compared to what the US Team will raise through corporate sponsors, major gifts and more. But it’s an interesting way to get broad-based support – which we all know is important – and also a level of engagement for those who give. I’m sure many will watch the opening ceremonies and think about their gift. They might even squint real hard to look for their stitch as the flag marches into the opening ceremonies. Hope they have a big TV! The website itself is quite interesting – the USOC does a good job of explaining why gifts are important, how money is used and the impact small gifts can make. The infographic is compelling – it takes just 20 stitches to provide a pair of boxing gloves, for instance. You can see where your gift can help in very real ways. The short videos about our athletes are interesting and the social media integration with donor wall is good stuff too. If you’ve got olympic fever and, like me, enjoy looking for new ideas on various fundraising sites, it’s worth a visit. Good luck to Team USA and athletes from around the world! Enjoy the GettingGiving Blog? Subscribe Here! Follow me on Twitter @GettingGiving!